I am new to astronomy and astrophotography. The last time I looked through a telescope must have been around 1979 when I was at school. I never truly lost interest but life and living in a large, light polluted, city kind of got in the way. Anyway, back to the present and my question. I will be moving to a very dark area of my country (South Africa) in the next few months and with lots of time on my hands having recently retired I decided to get back into astronomy, specifically the photography side as I am a keen photographer. Initially I am considering using my existing cameras and lenses (have decent lenses ranging from 12mm to 800mm). What I want to purchase is a mount I can use with the cameras/lenses but one that will also later be usable when I decide on a telescope, most likely a refractor of some description. I am mostly interested in deep sky objects. The mount that I have been looking at, mostly because it seems decent and there is local stock (helping with very high transport costs for heavy objects), is the Sky-Watcher HEQ5-Pro. I have read reviews and it looks good, just wanting to make sure I do not overlook a little point that might make me regret it later. In my mind, that is a great place to start! This uses ScopeStuff cradle rings (missmatched sizes, large for the front, smaller for the back). An ADM D-type for the base dovetail, and V-type for the top rail. ADM guidescope three-point rings and V-type clamps for the guidescope. It's also configured with a RigRunner for power, and a StarTech 7-port USB 3 hub. There is a DIY home made focuser on there as well, using the myASCOMFocuser project to allow me to focus the camera without a DSLR, using SGP and ASCOM. Edited by Jon Rista, 11 February 2019 - 12:47 PM. The Heq5 is a good choice if plan to start with astrophotography, but if the weight is not a major concern I should give a look to the eq6 too: it is larger and stronger, giving you more room to grow (especially because guess that, if plan to upgrade to telescopes, will be interested in very long focals having already a 800mm lens). Thanks for the comprehensive reply Jon! Yes, I am also mostly a Canon shooter so my 600mm is almost the same lens, just the III so similar in size and weight. Seems like mounting a large lens can be painful! I will most likely start with a 300 f/2.8 or 400 f/2.8 but the 400 is similar in weight to the 600 f/4. The 800mm is also similar in weight to the 600 as it is f/5.6. Nice looking setup you have there! Makes me wonder if just buying an integrated telescope/mount might not be easier for a beginner? Thanks, will see what is available as far as the accessories is concerned locally, at least they are smaller/lighter so importing is less of an issue. I did consider the HEQ6 but decided on the 5 as there is no local stock but you have a good point. I will contact the supplier tomorrow and ask him when he is expecting stock. It might unfortunately be a while since most local suppliers would wait for a full consignment of heavy stuff before shipping to save of the very expensive shipping cost to this far corner of the world. Thanks for the advice, I think I will make a plan and rather get the 6. Edited by Rudix, 11 February 2019 - 01:19 PM. Seriously - it may be easier - something like the ubiquitous 80mm (or slightly larger) APO on a rock-solid mount. Then you can attach one of your DSLRs to it. Also maybe a guidescope (depends on the mount). It is tempting, but I know I will soon want more. Will do some more reading, thanks! Yeah, for any of the Canon "Great Whites", including the 300 and 400, you will want to use the rig I have shown here. You won't want to mount any of them by the lens foot. We have to track with arcsecond accuracy, so imperceptible flex in the lens will wreak havoc on you results. When I was a beginner, I didn't quite get what was going on when I saw my stars trailing across my subs even in just about a minute or so of exposure. I think the Canon lenses can be quite rewarding...for their focal lengths, they are very fast, gather a lot of light, and more than most other types of true telescopes, TRANSMIT almost all of the light (around 99%, most scopes do not transmit that much light, some reflectors transmit a little over 80%). The Canon SWC (sub-wavelength coating, a nanocoating) results in ultra low scattering, which is great for chasing faint details. But, there are some challenges, so those rewards don't come for free. If you want to start simpler, I also recommend looking into a decent 80mm refractor. It'll just be easier. Are there any astronomy clubs near where you will be living? If so, also reach out to them and see what they are using for astrophotography. From the way you describe, your skies will be astro-heaven! My concern on lenses is focus. Granted, I don't have the wonderful lenses you guys have discussed, but what I do have, it is a real pain to get tight focus in comparison to my refractors. Also, which store would you be purchasing from? Maybe we could also look at their offering and discuss options from that store as well? Just a thought. Cheers and here's to many, many clear nights for you! Yes, love the Great Whites! I can see that they would need all the support they can get. I would most likely start smaller, maybe 400 f/4 as that is quite light and still great optically. Taking shorter but more exposures will also help I suppose? Then I can upgrade my mounting (and spotting) arrangement and move to the longer lenses. I have a technical background had half the fun of most of my hobbies are in playing with the equipment and getting the maximum out of it. I will most definitely get a refractor as well, there seem to be quite a few available locally and they seem surprisingly inexpensive, I suppose the long pro lenses and cameras I use have conditioned me to expect high prices! Hi Gary, thanks for the welcome! Yes, I have located a local club and will be attending their next meeting later this month. When I move to the dark location there won't be any local clubs but will stay in contact with the locals, I see they have an outing to that area once a year as well to get away from the light pollution! I might have located an EQ6-Pro mount locally, will call to confirm stock today. Below are 2 links to local shops I am considering, there are others as well but by the state of their broken pages I am not so sure if they are really still active but I will call and find out. I am not too worried about focusing my lenses, I made a few tests and all the bodies I would consider using (Canon DSLR/mirrorless and Sony Mirrorless) will auto focus on stars quite easily even at 800mm. For manual focus there is also focus peaking in magnified live view that is quite magic. Thanks for your time and advice, appreciate it! There are quite a few decent entry level and midrange scopes out there. If you are not averse to cost...then you might want to look into the Takahashi FSQ106 and the Vixen VSD100. Expensive, but known for their quality images and huge image circles. The FSQ106 is particularly popular. Native f/5, but can be reduced to f/3.65 (or even f/3.6, but the reducer alone is over two grand). The VSD100 is native f/3.8. Thanks Jon, will go and have a look at them, I have seen lots of references to the Takahashi FSQ106 already. BTW, just read your article on mounts, very informative, will be spending some time reading the rest of your articles, thanks for sharing! Both fsqs and VSD are nice telescope (for refractors' standard, the latter is really impressive), however, since already have nice glass, I would suggest to resist the urge for the refractor, which is the end is just a manual-focusing prime with fixed diaphragm and maybe a bit better performance on point-like strong lightsources, and rather put that money into a more proficient mount. You have a good point Alberto, chances are that optically the refractor will be inferior to the lenses I already have. I am still waiting for the local supplier to get back to me on the EQ6-Pro mount, maybe I will get lucky. The advantage with the camera lenses will also be that I have a wide selection of focal lengths to play with so I can work my way up to the longer end in steps. Ultimately I would most likely still get a telescope but then maybe rather top end unit once I am comfortable with what I have and I am sure what I want. I have been doing a lot of reading, fascinating stuff, lots of new information to absorb. Can't wait to get stuck into capturing some photons. Also started downloading and getting to know some of the software, there are many options but that is part of the fun. I have done photo stacking in the past, mostly for focus through a microscope but also low light work so some of the principals and even software is familiar. Seems like I have a rather limited choice as far as locally available equipment is concerned. If I want anything that is not in stock it could take quite a while (months) unless I am prepared to pay HUGE courier costs. I did have a look for local second hand stuff but there only seem to be reflectors available and right now and I would rather stick with a refractor. So my mind is pretty much made up, buy something (hopefully reasonable decent) to get going and then, once I have reached the limitations of my equipment and I have more experience to know what I want order something better. I have 2 options that look reasonable to me, the first is the HEQ5-Pro (no EQ6-r's available) mount, use that with my current Canon lenses and see how well that goes. It would need some work to get the lenses and finder scope / guiding scope mounted but not a huge problem. The second option is to purchase the scope/mount in the link below, it is in stock. I am not sure exactly what mount it is but maybe I could use that for my camera lenses as well, at least up to 300mm f/2.8 or 400mm f/4. It looks like it is the EQ5 Pro mount? I have been playing with software and some of the sample files on this forum, thanks to the people who uploaded the files, great practice! HEQ5-Pro is an *excellent* mount. I know people who have gone over the supposed photographic capacity with good results. The weakest part is probably the tripod, eventually replacing that with a pier or a better tripod would be a solid improvement. The EQ5 mount is not *nearly* in the same class. I wouldn't pick it for serious astrophotography. It may be OK (if you're lucky) with a light payload, but it will be easily outgrown. The HEQ5 will do great. I image with full payloads filling the 30lb capacity and it tracks and images fine. But I'm pier mounted, and it behaves much differently than tripod-mounted. Personally I would not bother using your Canon super teles, if you plan on ever using them for terrestrial work too. Pretty much a pain to setup and tear down each time. I too have big Canons but I don't bother putting them on the mount, as I use them during the day and tear-down and setup is a pain. 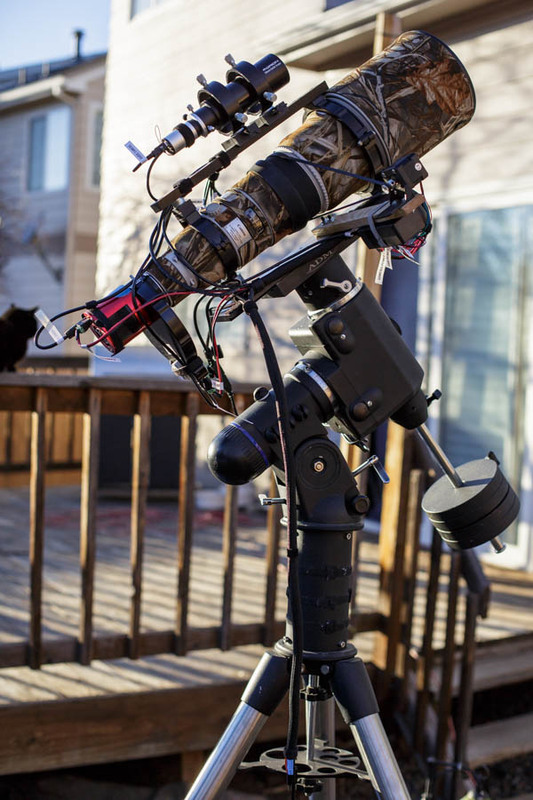 A simple small refractor will do the job and cost virtually nothing compared to the big Canons with AF mechanisms and stabilization and stuff that you won't be able to use. A decent triplet APO will cost very little and do the same job. I recommend you put a pier in your yard somewhere and get a mounting plate. These mounts perform even better on a pier than a little tripod. The tripod is virtually always the weak point. If you get the HEQ5, I can recommend you always pair a laptop with it and setup EQMod with it. Pick your planetarium software (I like Stellarium) and operate your mount and scopes with the laptop in a lush planetarium environment. It's just bliss! Then I will get the HEQ5-Pro. It looks like it will do the job far better than anything else I can get locally. Ultimately I can put it on a pier/permanent support, for the next 6 months it will have to do on the tripod but I do have some really heavy duty tripods that I can substitute if the original becomes an irritation. I appreciate you advice, thanks! Good news on the HEQ5-Pro, at the moment I have nothing that will get close to the max load capacity so I should be ok. I am keen to try the camera lenses (that I already have and seldom use), mostly because of the work that Robert Clark has done with similar lenses. But that can come later, I would love to compare a top end lens with a telescope. Having said that I am happy to get a refractor as it will be the easiest/quickest way to get imaging. Unfortunately none of the decent refractors that are available locally are OTA's only, that was why I was hoping to get one with a decent mount. If I purchase the HEQ5-Pro and a scope I would most likely end up buying a scope with a mount and then not using the mount. Maybe I can use the mount for some light work with short (14-200mm) camera lenses. The cost impact is fortunately not that bad so I am happy to do that. I am hoping to go and look at some of the telescopes this coming week and then buy one and the HEQ5-Pro. I have also looked at a guide scope and camera, what is available is the Orion Mini 50mm Guide Scope and the Orion Starshoot Autoguider camera. I am hoping it will do the job else I will have to import. Something else I need to consider is mounting the camera to the scope but I am hoping the adapters that I have that fits the 1.25" eye pieces on my microscopes will work, some of them were advertised as telescope/microscope adapters. I have them for Canon and Nikon mounts so it will allow me to try different camera bodies from Canon/Nikon/Sony that I have. A pier is definitely planned but it will be at my new (dark) location so it is a few months in the future. I would most likely build be a small observatory that can then also house the dedicated computer equipment with a network link to the house for winter comfort. It is going to be fun (and hard work) to setup the new property for my hobbies, it will also include masts for antennas (amateur radio) and a hangar + short runway. I have already installed and played with Stellarium and I like it. I am enjoying all the new software, DSS I have used before, Pixinsight looks like it is really powerful, will spend more time on it. At least 35+ years in IT helps. I started with the HEQ5 and got good results for ~2 years before upgrading to a Losmandy GM8 which is where I am now when I need to pull out the big scope (8" EdgeHD). As for optics, a 80mm is what everyone generally suggests for beginning in Astrophotography while you learn the ropes (nailing polar alignment, guiding, filters, imaging exposures etc) and its generally a nice wide field scope for larger targets. Edited by GraySkies, 18 February 2019 - 10:41 AM.